You can find this little bakery near the intersection of Sanjo and Kawaramachi streets. This little bakery may be little, but it has quite a history – it was founded in 1948. When you enter it, you get to see a cornucopia of bread spread out before your eyes. They are famous for their deep-fried beef steak sandwiches and red bean paste buns, but they also sell some European style bread that is not as soft as the Japanese offerings. All the baked goods are made here at the bakery, so you can be sure you’re getting fresh bread. They have a café area on the second floor, so you can enjoy the bread you buy there right away. This is a great chance for you to bite into the bakery-culture of Kyoto during your trip! You have a cutlet of premium beef, which is breaded, and then deep-fried. Two pieces of this deep-fried beef cutlet are then, after being slathered with a special sweet and savory sauce, put between two freshly baked bread slices. And so we have a complete Sizuya sandwich, one of their most popular items. Carne is a German-style soft bread, a specialty of Sizuya. It is buttered with Sizuya’s homemade margarine, enhancing the aroma. The thin slices of onion bring a bit of caducity to the taste, and the boneless ham may look simple but tastes delicious. Many generations of Kyotoites have grown up with this flavor. The bread is toasted until golden brown, the teriyaki chicken is tender and succulent, and the sweet and salty flavor of the teriyaki sauce makes this an unforgettable sandwich experience. And don’t forget the egg which balances the tastes and brings an interesting texture to the sandwich. This sandwich is pretty big and will leave you feeling full. You can get it with a drink for 780 yen. This is the classic, traditional Japanese red bean bun. Red beans are boiled until they become soft, then sugar is added to create a moderately sweet red bean paste. The thin bun is then filled with this paste, and; voila! The highest enjoyment possible for Japanese taste buds is ready. Although the names of the baked goods are only written in Japanese, you should have no problem discerning them from their appearances. 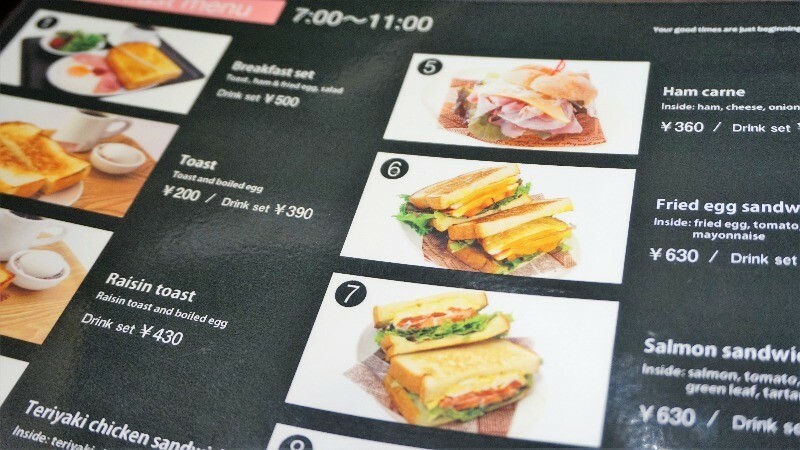 The menu on the second floor café is in English and has pictures so ordering should be easy. 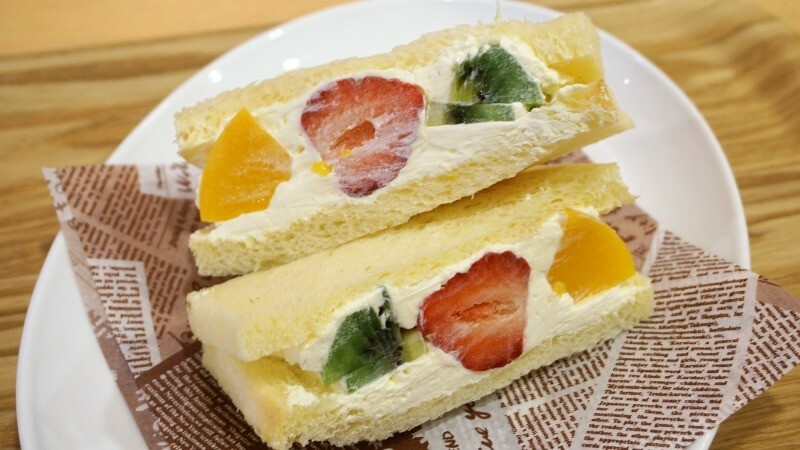 If you come to Kyoto in spring, you can get a limited edition seasonal fruit sandwich for 450 yen. A treat that needs to be tasted! Tasting freshly baked bread is such a wonderful thing! I sincerely recommend the beef sandwich; the crispiness of it is exceptional! It was not as greasy as I had imagined. The bakery is not too far from the Kamo River, so I recommend buying some bread and having a picnic there! In Kyoto, you can see bakeries of the Sizuya chain almost everywhere. You can enjoy freshly baked bread at all of them. At this bakery they also have a spacious café, so you can enjoy your bread right here. The area around the bakery is very popular with tourists. Let’s have breakfast here before starting our journey again! A 10-minute walk from Hankyu Kawaramachi Station or a 3-minute walk from subway Tozai Line Shiyakushomae Station. The bakery is conveniently located and has staff who can speak Chinese and some simple English. Everyone is welcome to come and try the taste of this time-honored bakery!